The Environmental Agency in a September press release reminds people to check fuel tanks for leaks. They say, “Oil is poisonous to fish and other wildlife and smothers plants and just 2 litres of oil could seriously pollute the volume of fresh water needed to fill an Olympic-size swimming pool.” That’s not much oil at all! The agency says that people should not buy more oil than is necessary and tanks should be kept in good condition. They recommend inspecting the tanks once per week. Below we give some specific items to look for and specific maintenance tasks to carry out. Bunded fuel tanks are designed to contain spillage, but will only do so if properly maintained. Even the best tanks will develop problems if maintenance is neglected. Most bunded fuel tanks come with a guarantee. You can extend the life of your tank even longer with regular tank maintenance. But even during the maintenance period it is necessary to properly maintain the tank to prevent damaging heaters and the fleet with dirty fuel, to reduce the risk of a fire or spill, and to remove any rain water that might have seeped into the tank. Because of harsh environmental conditions, overfilling, dirt and dust, vandalism and accidents, it is necessary to periodically carry out a tank inspection and check for damage. Check the overfill protection device. Check the shutoff valves. These valves should be locked to protect against vandals. To keep your tank in good working order, it’s necessary to tighten any pipework fittings and clean the vent. The vent needs to be pointing down with nothing clogging the free passage of air. It’s also necessary to make sure that any stickers or other instructions like “open” or “close” or the number to call is case of a spill are not smudged or rubbed off so that people can still read them. Sludge will build up inside the tank. It should settle at the bottom. If it’s possible for you to empty the tank completely―not everyone can do that, because they use it all the time―then you clean the inside of the tank. It is necessary to have a trained technician carry out the tank cleaning due to the risk of fire or explosion. Tanks also need to be checked for leakage which can expose your company to costly litigation or civil/criminal sanction. Plus it can cause a hazard in your immediate area. After a heavy rainfall, open the bund and check if there is rain inside. Remember that the rules are the bund should be able to contain 110% of the inner tank’s capacity. So that space cannot be taken up by water. There are automatic systems that detect whether there is oil or water in the bund before it pumps that out. If it’s oil, you’ll have to follow the procedures for proper discharge. That is the case when the water has more than 0.1% oil. It’s also necessary to check the physical security of the tanks like locked fences. Check that no one has banged into the tank. Check for vandalism. Check the supply pipework for corrosion or damage or that a heavy vehicle has not driven over and dented underground pipework. Doing that requires using a leak detection test. A bunded fuel tank should last a long time with the correct maintenance. Keeping it in good working order protects your fleet or generators and protects you from hefty fines from the Environment Agency for causing a potentially lethal fuel leak. 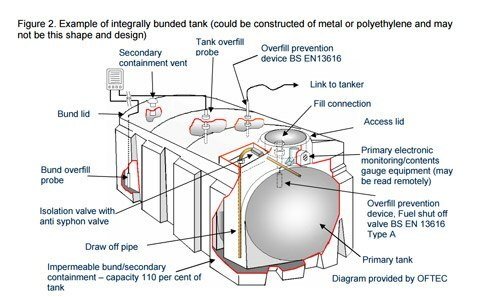 To keep your bunded tank in the best condition call us now on 0113 2012 460 and ask about Octane’s service and maintenance agreements. Tom is the Commercial Manager (MCMI, MIET) at Octane Holding Group Ltd and has over 10 years experience in the fuel system infrastructure and services industry.